Home Morgan's Corner Roving and Sliver and Batts! Oh My! Roving and Sliver and Batts! Oh My! Hand cranked drum carders create batts, while larger industrial ones will create either batt width roving or thinner. There seem to be an outstanding number of words that define the world of spinning fiber. Each one was developed to concisely inform about the steps and stages the fibers have been though. Some terms have evolved to have developed into general terms while others are still very specific to the steps that go into making it. Here are the terms you might or might not run across and how they are different from each other. 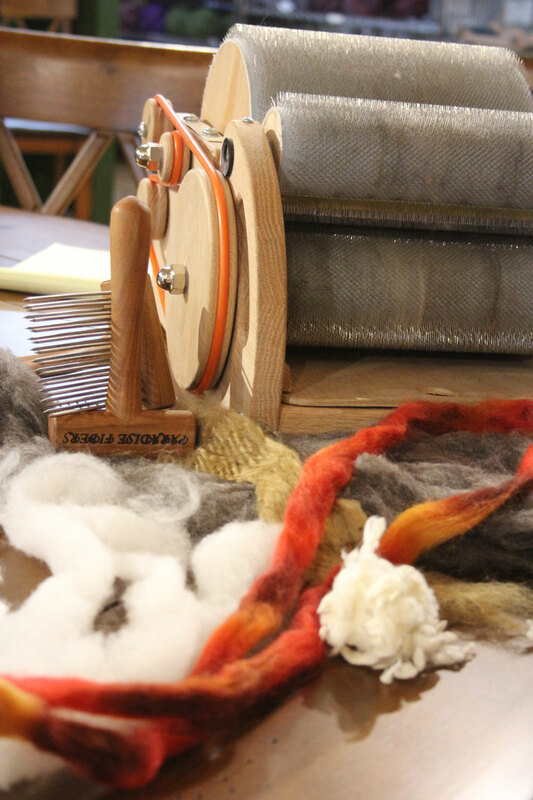 Combed: Combing fiber is one of the ways to process raw fiber into many different fiber preparations, it can also be the only stage some spinners use. When you comb locks you take and remove the nepps from the spinning fiber. Combs remove the shorter hairs and align the fibers. This step must be used to create top and silver. Carded: Carding blends the fibers together and to a degree aligns the fibers if used with combed fibers. Carding aligns some of the fibers together; however, this is not a perfect alignment and often creates lofty woolen spinning. Carding can be done with hand cards, drum carders or commercial drum cards. 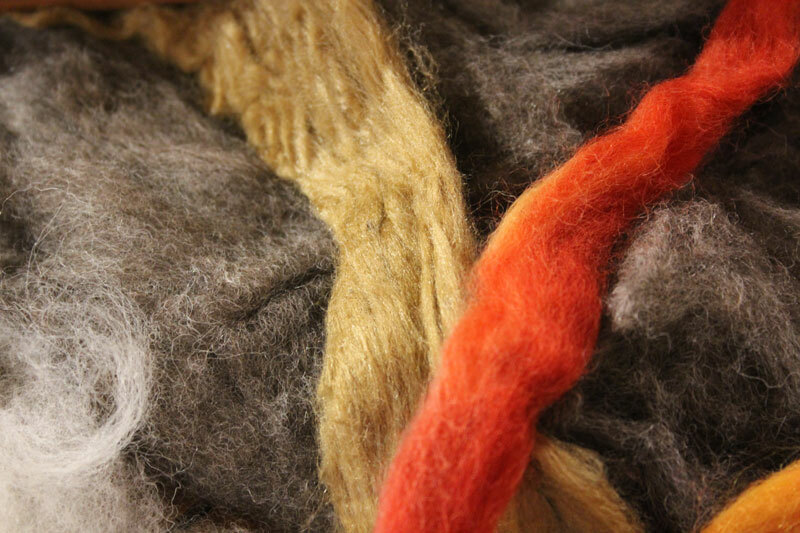 Lowest brown fiber is batt style roving, Red NortherLights Sunset Pencil roving, Golden Tussah Sliver Dyed Cinnamon. Still on Paradise Fibers Double Row Wool Combs the combed fiber is a true top that is then pulled through a diz to create roving or silver. Batt: Today there are two types of batts, commercial and from hand drum carders. Commercial batts are generally used in quilting as “wadding or filler” between the layers of quilting, they are often 1-2 inches thick and up to 120 inches wide. 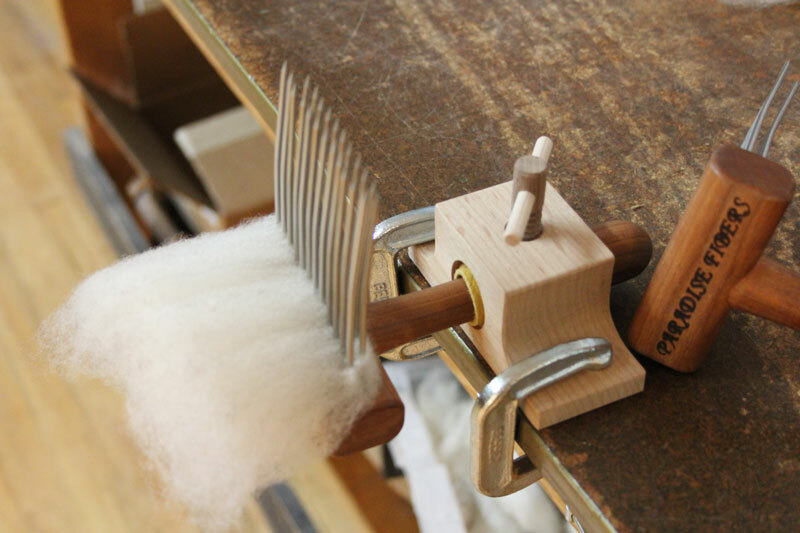 Hand drum carder’s batts are an effective way for spinners to blend fibers together. Custom batts are created by layering different fibers together and then passing them though the series of tines or teeth, which pulls and aligns the fibers together. Batts always have loft and spring to them. A non-quilting batt can be see here, as it is removed from the drum carder. 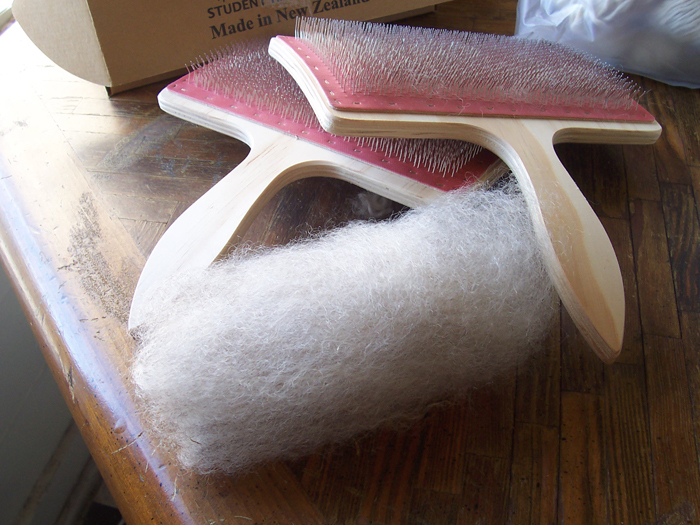 “True” Top: Top is a combed fiber, separating the out the longest fibers, which are then pulled though a diz and a slight twist is added to create a roving. At this stage all of the fibers are parallel with all of the extra air compressed out. Spinning fibers like these creates true worsted yarns. When you squeeze these fibers they will feel compressed and not squishy. Commercial Top: Most top seen today is commercial top, which is a variant of top and is always a roving. Nearly all of the fibers are going in the same directions; however, there are many more fibers and there can be considerable differences in fiber length. Commercial top is great for versatile spinners it can spin a fair woolen or worsted yarn as well as a range in between. Pin drafting often creates pencil roving. Pencil roving is always smaller around than a quarter. Sliver: The term is often used for cellulose fibers, such as cotton, flax or linen. Sliver is layered strips of fibers that have been combed and layered so that the fibers are parallel but no twist is added. Think of pulling the fibers off the comb and layering them in a strip and compressing them down. It is almost always thinner than top. Pin-drafting– This is the stage after roving, after wool has been drawn into a continuous rope the rope is then sent through a pin drafter. Which uses a series of fine combs or pins to produce an open, lofty roving. This step also aligns the fiber more than plain roving as it functions as a series of small combs that closely work the fibers. Pencil Roving– Pencil roving is a general term for any fairly slender, “long strip” preparation of fibers, requiring minimal drafting by the spinner. Silver, Top, Commercial top, and pin-drafted roving can, depending on thickness of the rope, be referred to as “pencil roving.” The general difference between pin drafted and pencil is how dense the fibers are. Pin drafting creates loft while pencil roving is generally dense thin commercial top. Cotton Punis on of the classic cotton preparations. 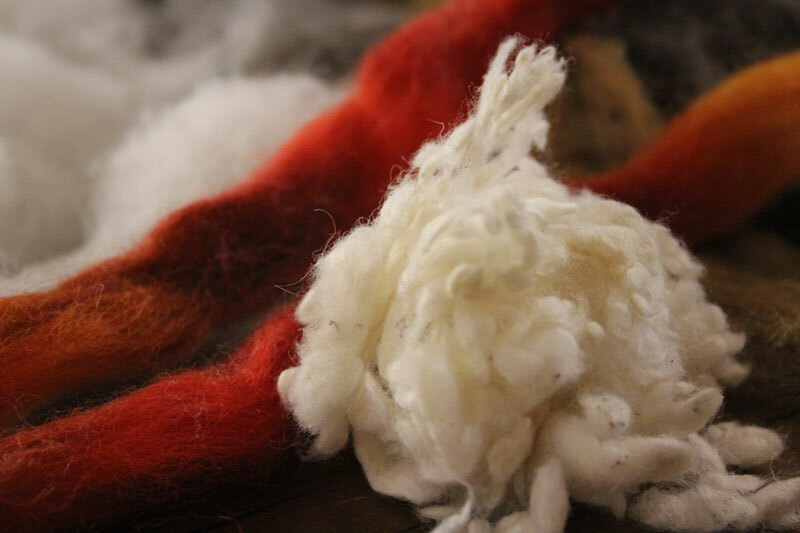 Rologs: Hand cards create rologs, or “poofy roll of fiber.” After carding to align the fibers the wool is carefully and evenly rolled back off the card. This fibers is spun from the end to create woolen yarn. Puni – this is adding an extra step to the rolog. It is prepared on hand carders, then the fibers are rolled on a stick and compressed by rolling this stick on a flat surface. This makes a tight tube of fiber that makes excellent long draw worsted yarn. It can also be pre-drafted to make semi-worsted yarns. This technique is often used for cotton and other fine fibers. Noils & Neps– These are what are usually separated and tossed out at the combing stage. Often these are the super short bits, the damaged tips and the less desirable elements removed when creating top. After being washed and slightly felted they are often added back in to art yarn projects. These are the short balls that create textured bumps in yarn. They can be added in after being dyed to created color and texture affects. 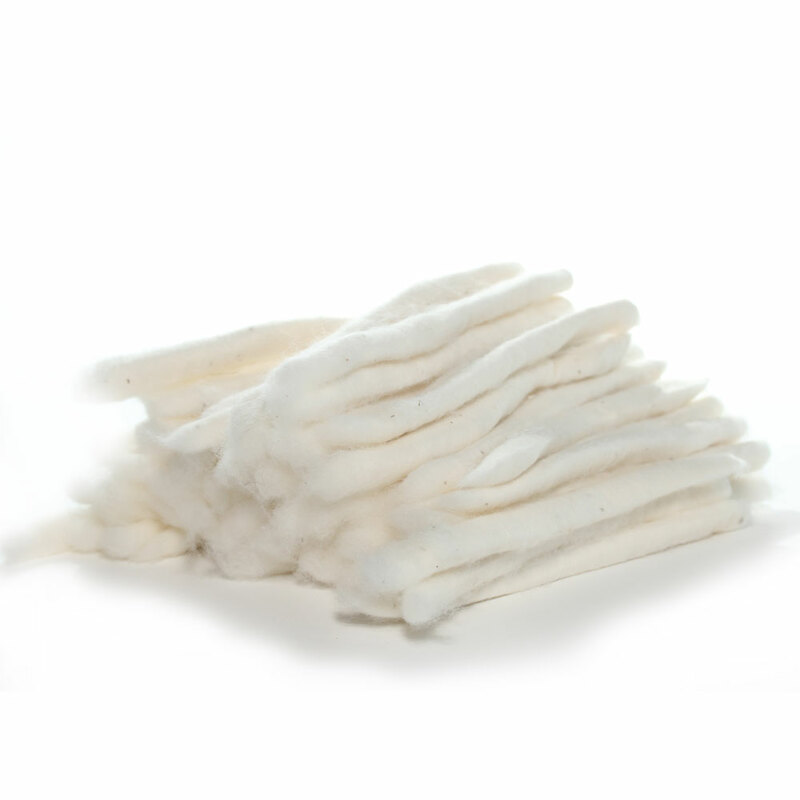 Lopi: Official lopi is made from the fleece of the double coated Icelandic sheep, and contains their longer outer coat and the downy undercoat. Lopi is the dual fibers pulled into a thin roving which is knitted directly into projects. It has very little twist, and is a step between silver and roving. The two different length fiber allows for better strength and cohesion yet holds less twist than yarn.